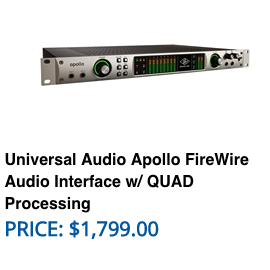 Buy an UA Apollo 8 QUAD or Apollo FireWire Rackmount Interface and get a FREE UAD-2 QUAD Satellite DSP Accelerator! The official blog of RSPE Audio Solutions. Based in Los Angeles, RSPE Audio Solutions is an industry leader in audio post, music, and broadcast equipment sales and service. Don’t miss this special end-of-year opportunity! 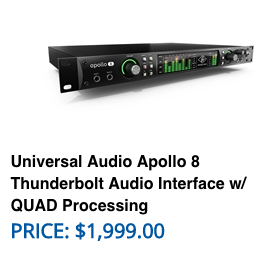 Buy and register a new Universal Audio Apollo 8 QUAD or Apollo FireWire rackmount interface between October 1st and December 31st, 2018, and you’ll get eve more plug-in processing power — thanks to a FREE UAD-2 Satellite QUAD DSP Accelerator — so you can record, mix, and master with more acclaimed UAD plug-ins. Offer valid only for customers who purchase and register an Apollo Apollo 8 QUAD or Apollo FireWire rackmount interface new from an authorized UA retailer between October 1st and December 31st, 2018. Offer provides one (1) UAD-2 Satellite QUAD Core DSP Accelerator per Apollo 8 QUAD or Apollo FireWire rackmount unit purchased. Apollo 8 QUAD Thunderbolt interfaces will receive UAD-2 Satellite Thunderbolt DSP Accelerators; Apollo FireWire interfaces will receive UAD-2 Satellite FireWire DSP Accelerators. UAD-2 Satellite USB and PCIe cards are not available as part of this promotion. New Apollo x6, x8, x8p, and x16 interfaces and the legacy Apollo 8 DUO, 8p, and 16 rackmount interfaces ARE NOT included in this promotion. Customers who register an Apollo 8 QUAD or Apollo FireWire interface during the promotional period are eligible for a free UAD-2 Satellite QUAD DSP Accelerator as outlined above. 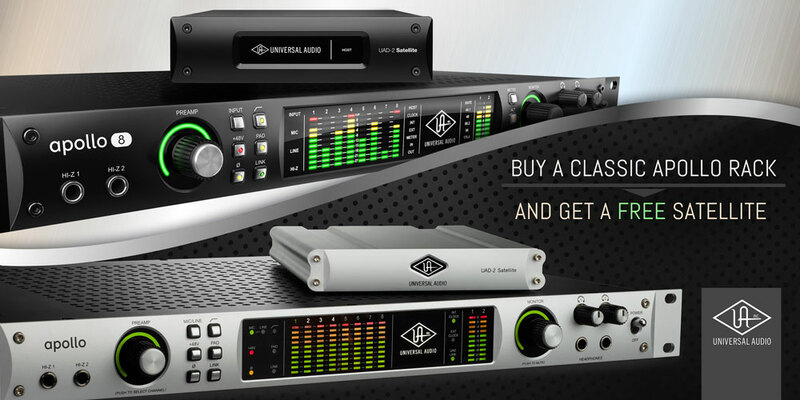 Customers will receive their UAD-2 Satellites directly from Universal Audio and will be prompted for their shipping information during the Apollo registration process. Allow 6-8 weeks for delivery. Universal Audio will only fulfill UAD-2 Satellites to addresses within the region which the qualifying Apollo interface was purchased. Universal Audio will not ship to post office boxes or APO/FPO addresses. Smart Post Sound is the most highly awarded post production sound company in the business. Its dedication to sonic perfection has earned the company no less than 15 Emmy Awards, 35 MPSE Golden Reel Awards and many more throughout its history. A recent expansion saw Smart Post Sound add two new sound stages and four brand new Avid S6 control surfaces to its facilities.President Joe Melody recently spoke to RSPE Audio Solutions, and shared the secret to the company's success. Get a Free 30-Day Demo of Dolby Atmos Production Suite The Powerful, affordable tools that let you produce immersive Dolby Atmos mixes in Pro Tools. Dolby Atmos Production Suite brings Dolby Atmos content creation to the masses! This software suite includes the Dolby Atmos renderer, Dolby Atmos Panner Plug-in, and Dolby Atmos VR Spherical Panner Plug-in. With Atmos Production Suite you can edit and premix content for a larger Dolby Atmos session—and do it all on the go with just a laptop and headphones instead of tying up your A-room or dub stage. These tools give sound editors, mixers, designers, and VR content creators working in Pro Tools a complete solution for creating immersive Dolby Atmos experiences. Try Out Dolby Atmos Production Suite Free for 30 Days*! Emmy Award Winning Sound Designer Paula Fairfield is most famous for her work on the hit HBO show, “Game Of Thrones". She’s the sound designer that gives the dragons their voice, and every roar, flap or hiss coming from one of Daenerys’ three dragons is created in the studio she built in her desert home near Palm Springs. The heart of Paula’s studio is the Avid Pro Tools S6 control surface and Colin Broad PD3 / A-Mon monitoring system that controls her HDX system. For Dolby Atmos monitoring, RSPE incorporated a JBL LSR system housed in the ASC AttackWall for Immersive Sound. The ASC AttackWall provides an optimum mixing environment that's portable and modular and translates every time. Stay up to date with Paula's adventures in sound design. Give her a follow on Twitter.